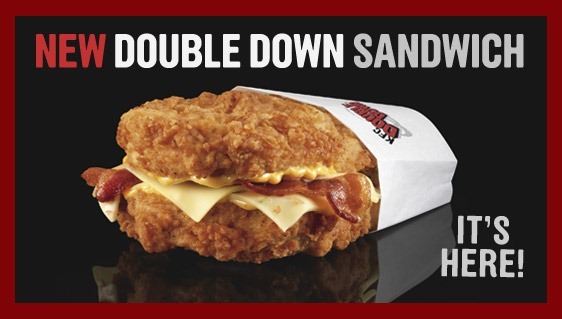 For more information, please see www.kfc.com/doubledown. Somehow they managed to make the grilled one worse than the deep fried version (less cals/fat, more sodium) which in itself deserves a bow. When done watching me eat, hit this blog up: This is why you’re fat . No, I did not finish it. It’s sitting on the kitchen island. Katie wouldn’t even have a bite. And geez, post it as a comment Jamie, nobody is going to SPAM you. (And as to the Anti-american hatemail… WTF? Oh well! !